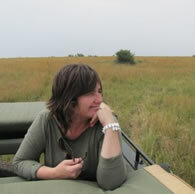 Livingstone Safaris was founded in 1993 by Sussi Galley. Based in Rondebosch, Cape Town, this is where dreams of Africa are handcrafted with expert care, delivering precisely as their strap line suggests; "Inspired Journeys, Timeless Moments". Specialists in creating bespoke holidays for the discerning foreign independent traveller to Africa, current destination knowledge is key. This, underpinned by a passion for all things 'Africa', ensures each trip is as unique as their clients' wish list. Sussi sets the definitive standard for travel planning within her team of Inspired Journey Experts. Whilst remaining at the helm of her company, Sussi has ensured that one of her daily challenges remains to perfect the art of preparing highly personalized travel plans. Each itinerary is a personal creation and a genuine expression of her own exploration of African travel and adventure. Sussi and her passionate team understand the importance of being first to identify new travel trends that affect her clients’ safari experiences.